…Over the next days and weeks and months my heart opened more than I could ever imagine. It was miraculous. There was no end to this vast, inexhaustible ocean of love. It was not the kind of love we usually experience in life—the kind that comes wrapped in desire, need and rejection. Unconditional love is absolutely pure; it wants nothing; it is oneness, the most fundamental truth of what we are. It is carried by the life-breath, flowing from the Source out of which we are born into the goal in which we dissolve. What an extraordinary time! I was like a dry sponge, parched for a lifetime, finally soaking up the water of life. I could not get enough. Maharajji was playful with us, more than intimate and always at ease, yet filled with enormous power. Every morning and afternoon, we Westerners hung out with him. 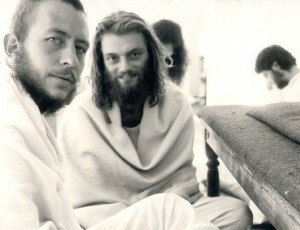 We sat around absorbed in his being, sang kirtan, and drank chai. We called it the five limbed yoga: aimlessly walking about, telling stories of the Beloved, eating, drinking, and letting our love flow into song. This is what lovers do. It is the path of bhog, of the enjoyment of divine love, of bhakti. The discipline of this love is enough to peel away the effect of countless lifetimes of pain and confusion. Letting yourself dissolve in love like this is the ultimate yoga, leading to final union with the Beloved. Maharajji didn’t teach like other gurus. In his liberated state of mind he experienced himself as completely one with us; our reality was his and he met us there on the inside of our thoughts and emotions. From there, from inside our hearts, he taught through a simple gesture, a look, a smile, a frown, a few direct words and much laughter. There were no speeches, no theology or philosophy, nothing to learn but this love. He didn’t give us anything that could feed the mind and separate it from the heart. Instead, there was the constant, exhilarating, and spontaneous joy of devotion. His love was his teaching. It was perfect. There didn’t need to be anything else. Simply to be in the presence of such absolute love changed us completely. As I sat before him day by day, gazing up at his form, my mind became still and my eyes and my heart devoured every line in his face, every expression, every one of his movements or sounds. His form, his presence, his every gesture fed my hungry heart and little by little I became more absorbed in this love. Years later I saw a young mother gaze at her newborn child, totally immersed in the unfathomable miracle before her eyes, and I realized that this was the way we had looked at Maharajji, absolutely abandoned to the miracle before our eyes. When we weren’t with him, we told stories about Maharajji to each other. It helped us stay bathed in his presence. It is a way to keep the heart open and train the mind to stay focused on what is most important. Feasting on love was and is our yoga, our practice of union. We are doing it to this day. What else is there to do when you can have direct access to the most sacred place of the heart? In this way the days went by in a flow of intense grace. The depth, texture, and degree of this love were entirely new to all of us. Something like this was simply not known in the world where we came from. We had found a piece of heaven on earth. Day after day I sat in front of him, adoring him, dissolving in love. In the timeless space of his presence, my heart was filled and my mind became still. I didn’t speak his language and it didn’t matter at all. Actually, I consider it a blessing that I didn’t understand what was being said, as my deep communion with him took place on an entirely different level—the wordless communion of souls, the absorption of lovers in which I understood absolutely everything I needed to know. It went on like this for many weeks, until one evening, as we all sat together, someone said, “Wasn’t it amazing what Maharajji did today?” And with sudden astonishment, almost shock, it registered in my mind that there were things going on other than this silent absorption. I had been too immersed in loving him to reflect on anything other than our undisturbed intimacy. From that day on, little by little, my mind came back. I didn’t fall out of love. No, it was far too late for that. Come what may, I was going to dissolve myself in this love. And now, because I had asked to be free, everything in me that stood in the way of my freedom began to rise to the surface: my old emotional turmoil and the mind with its desires, judgments, and fears. The purification of mind and emotions began anew. Maharajji loved me in exactly the same way—but it was I who could not love me as my sense of separation, my feelings of jealousy and rejection, anger, and fear started to surface again. For moments or even unbearable hours, these feelings would separate me from Maharajji and from my own heart. In the presence of such great love, even the smallest thing that obscures the heart is experienced as a profound disturbance. At times I would feel completely cut off, abandoned, hopeless, or angry. In the light of the love that surrounded me, these thoughts and emotions felt incredibly out of place. I remember sitting right next to Maharajji with my friend Vishnu Digambar immediately to my left. For two days Baba had not paid me any attention. It was dreadful. I lived entirely for his love and as of yet I was not able to find its source within me. Instead waves of jealousy and dejection were stirred up to a mighty storm. In these externally so peaceful surroundings, sitting at the guru’s feet surrounded by my closest friends in the world, I felt completely alone and abandoned. Of course all he had done was not to feed my sense of self-importance for two days! Vishnu on the other hand had received all the attention and this had plunged me into the bowels of hell. He sat there, his face beaming and his lap full of prasad. I had not received a single morsel. Obviously that proved that I was completely unloved and unworthy. Not even here I could open to love! There was no hope for me and if I had any sense, I should just go and kill myself! And then Vishnu took one of the apples Maharajji had given him and gave it to me. My experience of this moment was that Vishnu and happiness were thousands of miles away and his arm reached through an infinite tunnel from heaven into the hell of my loneliness. Out of that tunnel of my self-imposed isolation the apple dropped into my lap and I was connected again. Where there is a great amount of light, any darkness becomes very noticeable; the shadows seem deeper. Self-realized beings emanate a light that allows us to see our internal obstructions with grim clarity. We need to become aware of these dark places before we can become free of them. Our confusion will hold us prisoner as long as we are blind to it. But no matter what negative thoughts or emotional dramas possessed me, as soon as I was ready to let go of my attachment to my most current tragedy, there he was again, looking at me with that same absolute love. And I would melt as the walls of my self-imposed prison dissolved. 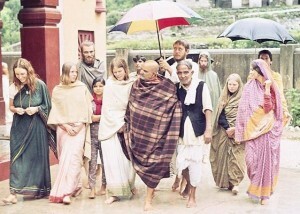 By far the most remarkable moments were when Maharajji would look directly at you. While these glances were usually short, they left an indelible impression. For a moment you were able to look into the presence of absolute love and complete emptiness. The only way I can say it is that it was like falling into the eyes of God. And what you saw there was infinitely attractive, so absolutely irresistible that it could terribly scare you. To let yourself go into this depth was dissolution; it was the end of how you had known yourself. No sense of a separate “I” could survive in this space. It offered the annihilation of the self in divine love. And although I wanted this dissolving more and more every day, I felt not ready for it. Deep inside me there was a place I could not yet surrender. It was a hard place, a way I felt I needed to hold on to at least some identity in fear of not being able to function without it. That was my delusion. We can function in the world better than ever without the false sense of “I”, allowing the deeper wisdom of the heart to run our lives, but this knowing had not yet matured in me. And so, when he would look away again, I was left with an after-image of this glance into the mirror of Self that showed me how I still clung to the very source of my suffering, this sense of “I”. And each time my yearning for freedom flared up with renewed passion. The dance of lovers moves between two extremes, between the bliss of union and the agony of separation. 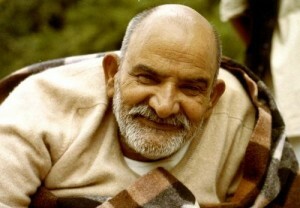 I would sit in front of Maharajji with my heart wide open, basking in the pure bliss of his presence. Then a stressful thought would arise in my mind, perhaps a judgment or a desire or self-doubt. That’s all it took for the “I” to take over. As soon as I believed that thought, I had already plunged from heaven down into hell. At times this descent was so intense, I could hardly breathe. Then I would look at Maharajji and the clouds of worries, self-judgment and shame would begin to dissolve again. By doing nothing, by simply being the love that he was, he woke me up again and again out of these trances of pain. I began to see more clearly to what degree stressful thoughts and emotions ruled much of my life. One single negative thought could shut down my heart even while sitting right in front of my guru. Being with him was an intense purification through the fire of love. The old habits of mind were burning up. This fire of love is ruthless, incinerating anything in its way and that was what I wanted. My mind began to be turned into ash. In the world of the yogis, pure white ash is a sacred substance of utmost purity. In ash anything that can burn, anything that is other than absolute truth has been burned and so it is a symbol of what remains of the mind in one who is free. Love and the desire for truth burn everything until no impurities remain. In this way the mind is cleansed of desire, aversion, and ignorance, the great poisons. The mind of enlightenment is free and pristine; it no longer creates confusion and pain. Such a mind does not stand in the way of love. It has merged with the heart. When the separation between the heart and the mind has been dissolved, what’s left is oneness—within and without—the union of self and other, of lover and the divine Beloved. In my right mind I wanted nothing other than this union. But when the burning was intense, I fell into all the expected reactions of the ego mind: I complained, felt sorry for myself and made feeble attempts to escape. But every time I got a reprieve from myself and realized how much lighter I felt, I asked for more burning. The love, the purification of mind, and the moments of playful teaching continued day after day. Each day followed the next like lustrous pearls on a string. I had almost forgotten that a world existed outside this Himalayan valley with its sacred chanting, its temples and bells, and this liquid essence of love that melted all defenses and fears. Despite the process of purification, I knew that if there ever was a Shangri-La, I was living in it. Why waste a single thought on a world other than this? Maharajji had become the unshakable core of my world. And unshakable he was indeed. I looked into his eyes and felt absolute peace. I noticed the way he was present in his body and I understood unlimited power. I saw how he played and joked with us with perfect ease and felt his infinite kindness. I heard about the stream of miracles that routinely happened around him, but it was the love that touched me so deeply. One day I sat before him, peaceful and deeply absorbed. All of a sudden he roused me out of my contemplation by sending me to the nearby temple of the Divine Mother. His simple gesture came with a power that shook me to my soul. I walked the few steps to the temple of the Goddess, sat down and gazed at her statue, feeling deep into her brilliant eyes. In that silent communion, I realized that the adoration of the feminine aspect of God would be a vital part of my journey. In one gesture, one wordless and potent motion, Maharajji had put me under the protection of the divine feminine and given me a focus and source for my worship. Another day he turned to me and asked, “Who are you?” The question went to my core. It was not about my name, my history, or my personality; it was about my true identity, my Being. I said simply and truthfully, “I don’t know, Maharajji.” Clearly, I had to find the answer. This question, “Who am I?” is the essential method of the ancient yoga of self-inquiry. Maharajji offered us the path of devotion or bhakti, the path of loving surrender to God, and by his question he pointed me toward self-inquiry, the yoga of the mind, a different path from bhakti (or so it seemed at the time). Many years later, self-inquiry found me in a remarkable way and turned out to be crucial in bringing his gifts of love to fruition. Another time he opened the floodgates of my heart even further by showering me with special affection. He praised me and heaped fruits and sweets into my lap. This was prasad, food that had been blessed. Prasad, as well as the touch or glance or words of a saint can serve as the medium for the transmission of teachings and grace. It is the outer sign of something that occurs on the inner planes. In this case he gave me a taste of himself. The effect of this was staggering. I felt powerfully charged, opened completely like a flower drinking in the sun. I had not known I could drink this deeply. A vast happiness flooded through me. I walked through the valley two feet off the ground. I had limitless energy. I was in a heaven much more exquisite and thrilling than anything I could have imagined. This was true divine bliss, the realization of freedom. It was the ability to love the whole world. It didn’t cross my mind then, but this experience of boundless bliss was one answer to his question, “Who are you?” This bliss is who we all are. We are this supreme happiness. It is our true essence; it is what we exist to discover. This state of pure ecstasy lasted for a few days. I had the sense that Maharajji had granted me a taste of his world, the realm of the siddhas, the great enlightened ones who grace our physical world when there is an urgent hunger for freedom among us. When we are oppressed by darkness, they come to spread the light of their Being and to show us the ancient and timeless pathways to freedom in new ways so we can understand. True Siddhas are very rare in this world. They move effortlessly beyond what we consider the immutable laws of creation. What we regard as miracles are the natural ways they express themselves. They appear among us for one reason alone: to lift us up through their compassion. Maharajji, the mahasiddha, granted me as much of a taste of the bliss of his state as I could contain. After a few days of this, I started to slip back into my more limited state and began to forget. But I was not going to forget completely! I became even more determined to realize this bliss and the freedom Maharajji was showing me. The guru, the divine Beloved, is a doorway through which we can come to live in a land of unimaginable splendor of true freedom and bliss—the realm of enlightenment, the world of the perfected ones, our true home. It is a state of highly refined awareness, and it is utterly down-to-earth at the same time. It is the philosopher’s stone, the Grail cup, the Buddha mind, the Kingdom of God Jesus spoke of. It is waiting for us. In my experience Maharajji was simply love. It was all about love. Through the cleansing effect of his presence Maharajji relieved us of a great deal of our burdens, but he did not take them all. Above all, he left to us the most important task, to learn to love ourselves as he loved us. Once we learn to do that, then, and only then, can we fully love others and the whole world. I have never left my seat by his takhat. A part of me still sits there today, with a still mind and an open heart, breathing in the rhythm of my Beloved. The one is two and the two are one. Timelessness never ends. Bhog, ‘pleasure’ or ‘delight’. The term is used here to illustrate the difference between yog(a), the effortful striving toward divine union and bhog(a) the playful merging into that same ultimate state through admiration of the Beloved who represents the ultimate in his or her being. “Shangri-La,” a mystical, completely harmonious valley in the Himalayas, an earthly paradise of profound happiness, isolated from the outside world. For an account of many of Maharajji’s miracles see The Divine Reality of Sri Baba Neeb Karori Ji Maharaj, by Ravi Prakash Pande “Rajida.” Available from: Sri Kainchi Hanuman Mandir & Ashram, Kainchi, District Nainital – 263132, Uttaranchal, India. Prasad. Visitors brought a constant stream of fruit and sweets as offerings to Maharajji, which he then distributed to anyone present. Through this prasad, he transferred special blessings.